If you are installing a rainwater harvesting system, ensuring you have high-quality clean water is essential to the health of everyone that uses it. To make sure that the water going into your storage tank is the highest quality it can be, you can use water diverters. Diverters separate contaminated ‘first-flush’ water from fresh, clean rainwater which is sent to storage. In this article we discuss how the water diverters work and the different types that are available. All diverters perform a similar function. The overall concept is that when it rains they ‘divert’ the first-flush of water off the roof into a separate reservoir. This first-flush of water contains the contamination you might have on the roof and within the pipes if there hasn’t been any rain to wash them for a while. Contamination can range from animal-droppings to tree leaves and more. The reservoir is sized so that it holds a little more than the volume of the contaminated water, which depends on the surface area of your roof. Once this first-flush fills the diverter, the water that follows behind will be clean. Since the diverter is now full, the water following behind flows into the storage tank instead. Diverters allow a slow trickle of water to escape their reservoirs (usually into your garden bed or stormwater drains) so that they will be empty and ready to capture the first-flush from the next rain event. Downpipe diverters are comprised of downpipes with a slow release valve at the bottom. They hang down from the pipe which flows into the storage tank. A T-junction is normally placed in the pipe feeding the storage tank. One end flows down into the downpipe diverter, the other horizontal opening continues into the storage tank. The downpipe diverter acts as a reservoir for contaminated water. When it begins raining, the first litres of contaminated water flow down into the downpipe diverter. A small floating ball sits within the diverter and as the pipe is filled, the ball rises and seals the T-junction. This diverts the clean water into the storage tank. As the downpipe diverter has a slow release value, after the rain stops it empties, ready for the next rain event. National Poly Industries supply downpipe water diverters. If you are using downpipe diverters, they need to be placed on every pipe that flows into your storage tank. More information can be found about how downpipe diverters work here. 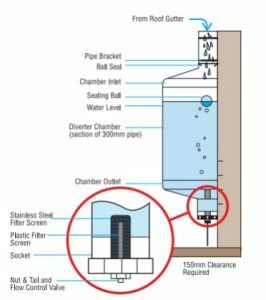 Tipping gutter diverters are a simple system that is often built for separating contaminated water. They work by having a small section of gutter that pivots either into or away from the storage tank. When the first-flush flows into the gutter, it is sloping away from the storage tank and so the contaminated water is diverted away. This diverted water fills a ‘bucket’ which is attached to a pulley. As the bucket becomes heavier, the pulley raises the gutter. This tilts the gutter towards the tank, allowing the clean rainwater to flow into it. The bucket has a slow release value which allows the contaminated water to drain after the rain stops. When the bucket is empty, the pulley system tilts the gutter back to its original position, sloping away from the storage tank, ready for the next rain event. Post/Wall water diverters work in a very similar way to downpipes diverters. The difference is that the reservoir can be much bigger, almost like a mini-tank itself. This also allows contaminated water from multiple downpipes to be collected and drained in one convenient place. These diverters can be used for a wide variety of uses, and can be mounted on an exterior wall on or a sturdy post, hence the name. To use a post or wall diverter, all your downpipes need to connect into one feed pipe for the storage tank. This connection happens before the diverter, since such ensures that the contaminants from all your downpipes are collected in the single diverter reservoir. You will also need to size your diverter appropriately to make sure it has capacity for all of your contaminated water. In-ground diverters are used in a wet rainwater system. They are buried underground, connected to the lowest point in the system, at the bottom of the riser pipe which feeds the storage tank. Similar to the other diverters, the in-ground device separates the first-flush of contaminated water and stores it in a reservoir, allowing clean water to go to the storage tank. The difference with in-ground diverters is that they serve an additional purpose after the rain stops. In a wet system, water that has not been forced into the storage tank before the rain stops can remain in the pipes. This can cause problems with bacteria or insects laying eggs. With an in-ground diverter, this water continues to flow into the diverter and is slowly drained. This leaves the pipe system dry, increasing your tank water quality. Commercial diverters are virtually the same as downpipe diverters, however they are adapted to the larger piping and water capacities needed for commercial buildings. 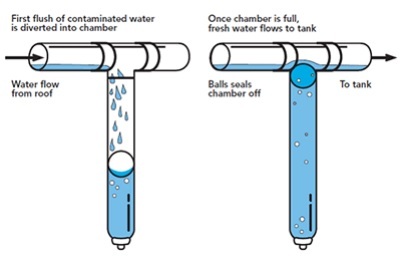 Water diverters are a simple device that significantly improve the quality of water in rainwater tanks. Their simplicity means that maintenance is low – you only need to clean the filters and check for blockages occasionally. Because they remove contaminants from the rainwater, they also increase the life of water pumps and appliances. If you are looking for a water diverter for your rainwater harvesting system, talk with our team today about your options.